Life These Days | Live. Learn. Love. Eat. Sometimes I just feel the need to write and reflect upon life the way it is these days. To hold onto the memories and look back on them with gratitude. It is so easy to get too busy to notice the little details in life that are passing by, especially when you have little ones. 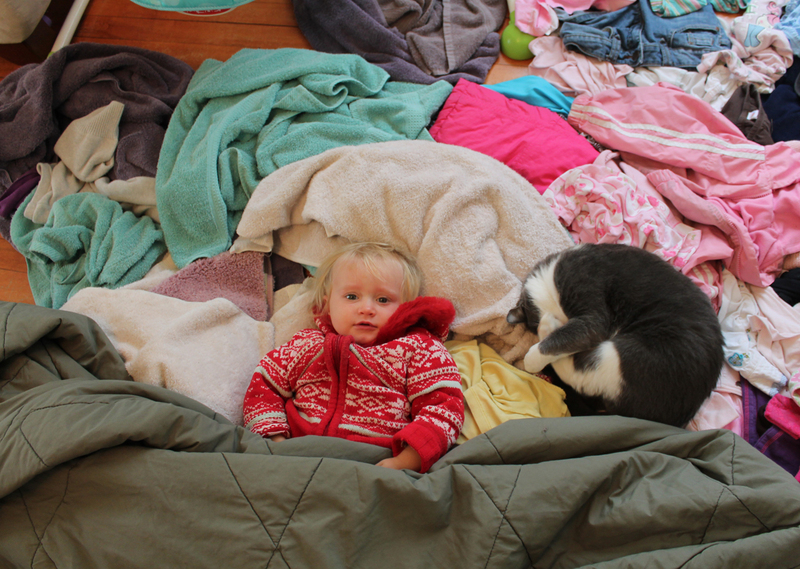 Serafina and Luka, our cat napping side by side in the giant pile of laundry. I had to wash nearly all of our clothes because we had a mini flood in our house while we were out for the day and the water had been turned off in the town, due to a water main break. Someone left the tap on upstairs in the bathroom because the water had been out at the time. Meanwhile, we were gone for many hours when it must have got fixed and when we got home I panicked when I heard the sound of water trickling away. At first I thought that it was from the kitchen, but no, it had to be the tap upstairs. We had water all over the house, flooding down the stairs, into the living room and through the floor all the way down into the basement where I keep all of the girls clothes that no longer fit to be used later on. It was a lot of laundry. Days and days of laundry. Did I ever mention my least favorite job is doing the laundry? Once Serafina fell asleep on me I had to get up and lay her down. This spot seemed comfy and safer than on the couch. Soon the cat decided to curl up beside her and I just had to take a picture. By the time I got there with my camera she had woken up. 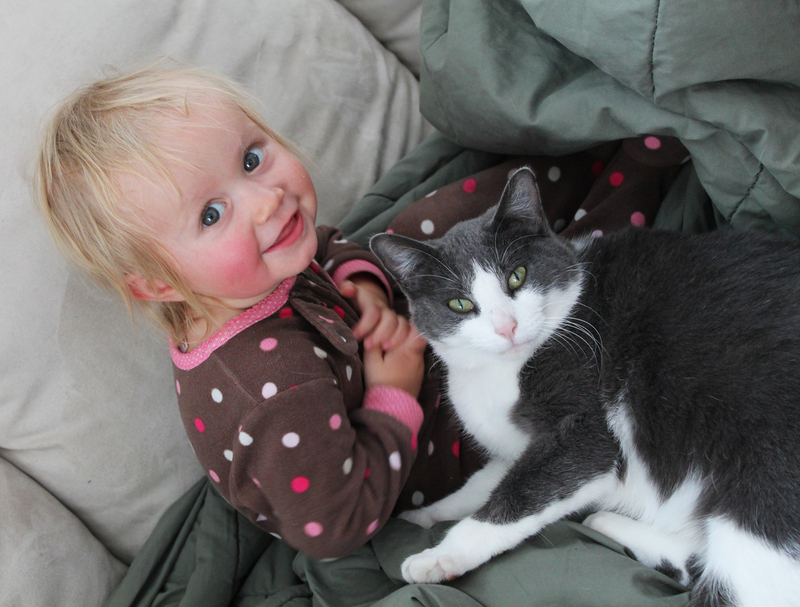 She absolutely adores the cat and the cat adores her too! I am grateful that we got all of the water cleaned up and that there was no serious damage done. Just a lot of laundry! 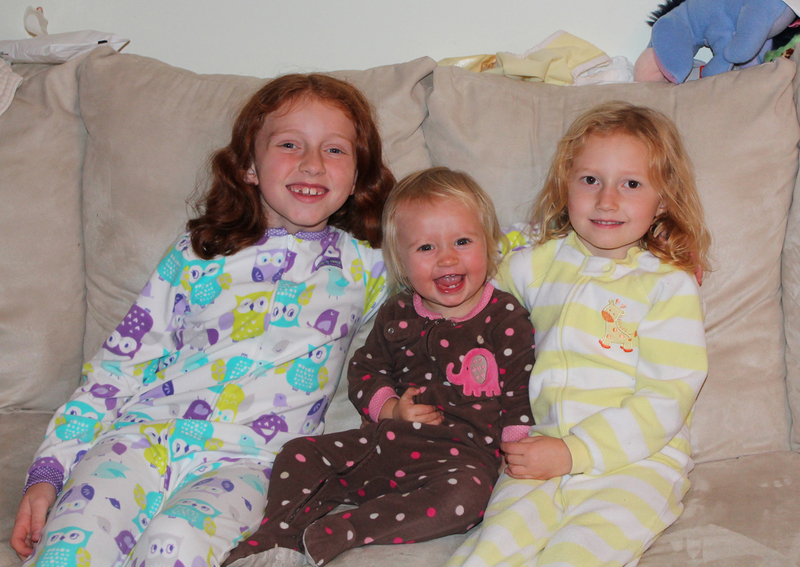 These three cuties in their sleepers. For her birthday, Autumn wanted a sleeper just like her sisters. I found a sleeper in size 8 and bought it for her. It is the most enormous sleeper I have ever seen in my life! 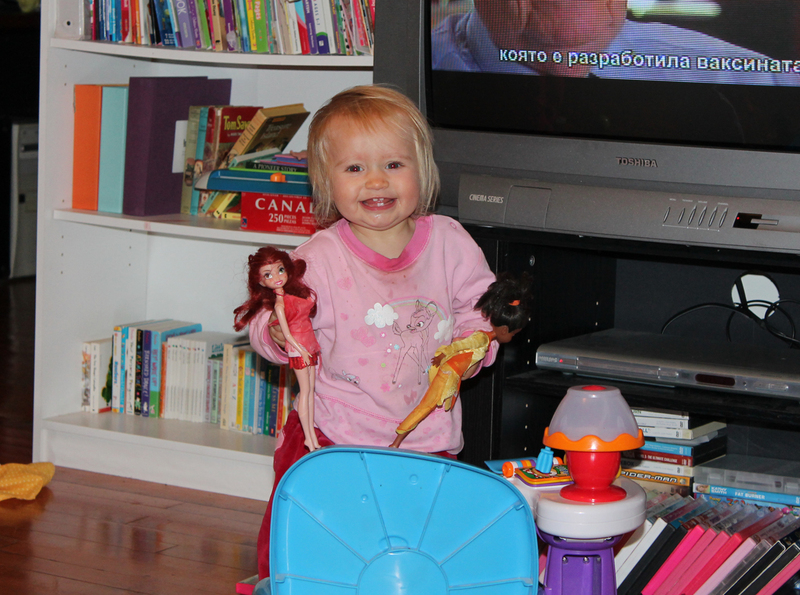 Autumn was very happy and surprised to get it for her birthday present! It was getting Kesa not to tell what we bought that was difficult. Seeing this little girl grow up and start to get braver at taking steps to keep up with her sisters! She is so proud of herself! Emergency baths in the kitchen sink! Soon she will be too big for them. I am grateful to have Autumn learning at home. These days she is practicing her writing. 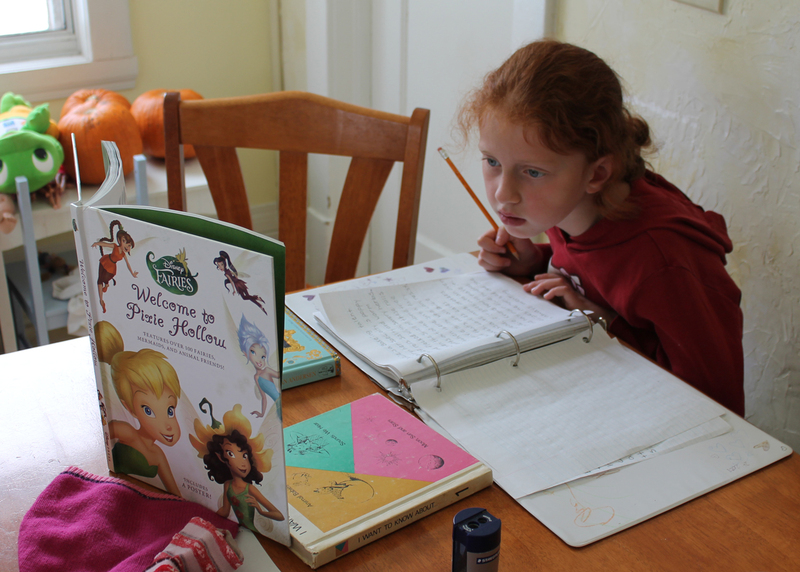 She is writing about all the different fairies that live in Pixie Hollow. I told her that she can write about whatever she wants as long as she is practicing her writing and she just loves fairies. 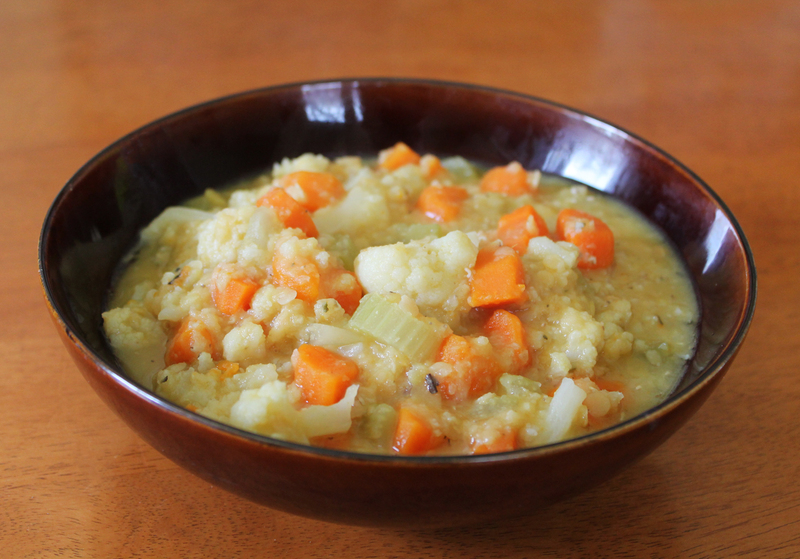 This yummy recipe, Red Lentil and Cauliflower Stew! It is so good that I want to share it, though I wonder if it should remain a surprise for when the book comes out. We have been enjoying this and Black Bean and Barley Vegetable Soup a lot these days with bread and margarine. Soup and bread in fall are just perfect to me. 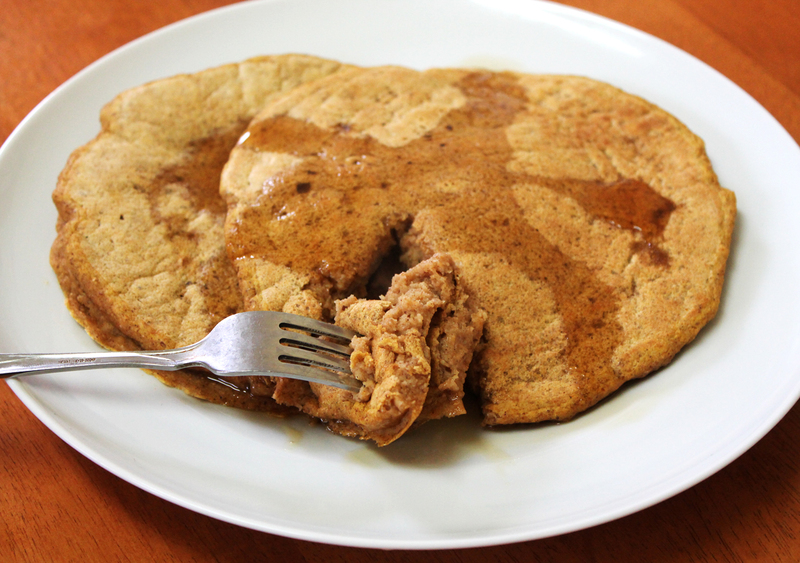 We’ve also been enjoying many more recipes with pumpkin, including these delicious pumpkin pancakes. 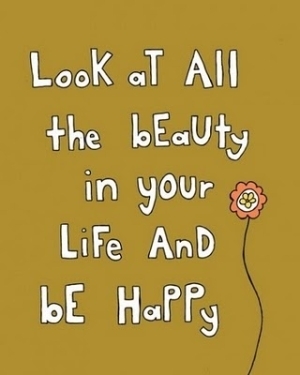 I am grateful for my happy, healthy bunch! 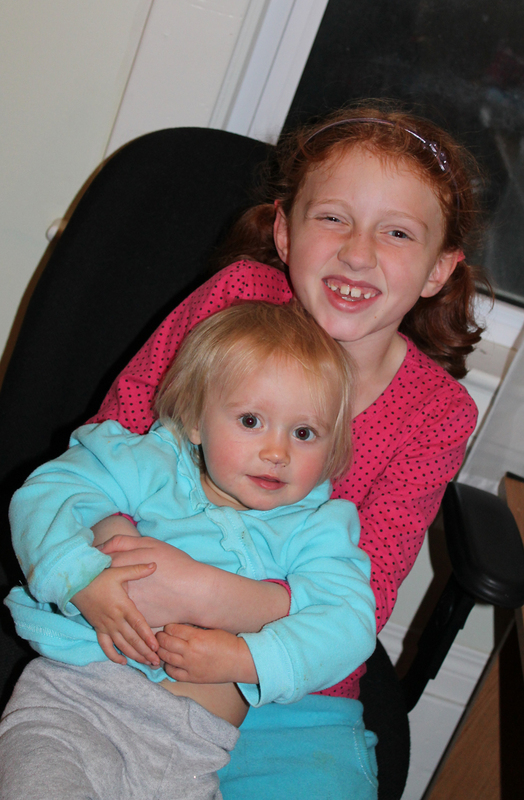 I feel blessed to be able to be home with my girls even though it is a huge job. 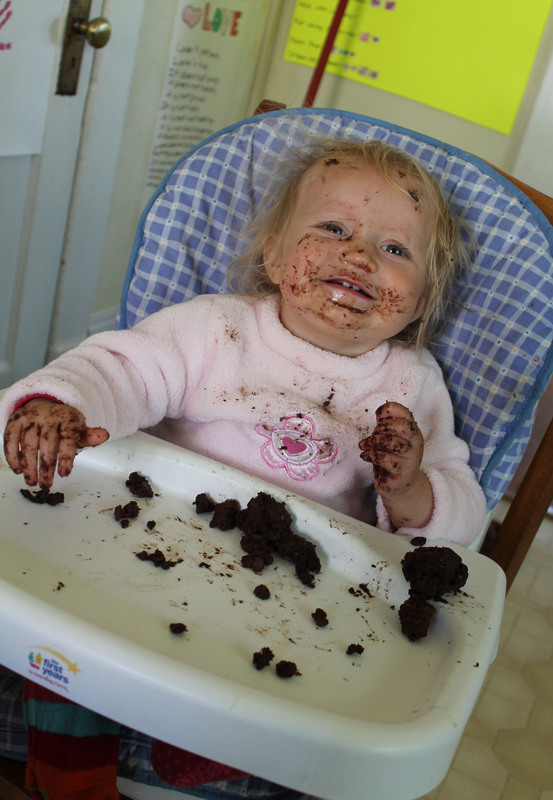 I have given up on trying to keep the house clean (my version of clean) during the day because there is always so much learning, adventuring and playing going on that there really is no point. At least we are cozy and comfortable! Look at Serafina’s little red cheeks! Too sweet. Beautiful post. Wishing you a lovely weekend filled with love, laughter and joy. Thanks Elle! They are the best of friends!